So there we have it. On Thursday 20th June 2013, we celebrated 50 pukka years of Pukka Pies! And what a 50 years it has been, a company rising up from the Storer family kitchen to a whopping 60 million Pukka Pies sold each year. That's a lot of pie! Take the Steak and Kidney Pukka Pie, which still uses the same recipe as it was originally designed with. Pukka Pies continues to go from strength to strength and it is a pleasure to see them in fish and chip shops and football stadiums (and supermarkets to!) up and down the country. And as if working for Pukka Pies wasn't an awesome enough job already, to celebrate the 50th Anniversary they've only gone and given their employees a bonus Pukka Pie Holiday (way better than a bank holiday in our eyes!) While we sadly couldn't make it to the 50th celebrations, we hope everyone had a pukka time at Pukka Pies HQ. Oh, and of course the Pierateers had to have a Pukka Pie last Thursday to celebrate in our own special way! 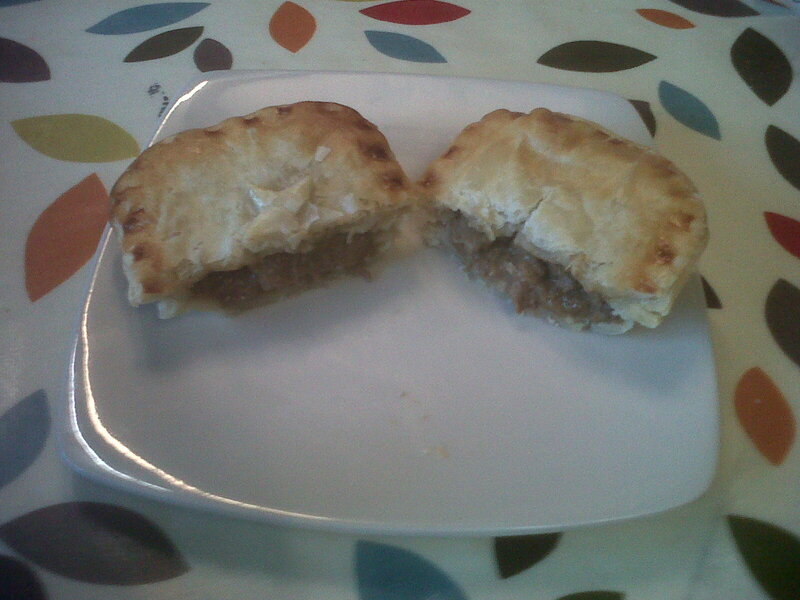 The age old question: Do (Pukka) pies taste as good in Wales? And finally, to end an article like this, there's only one thing you can say: Here's to the next 50 years... Pukka Pie anyone?! continue reading "Celebrating 50 Pukka Years"
An iconic war time poster. 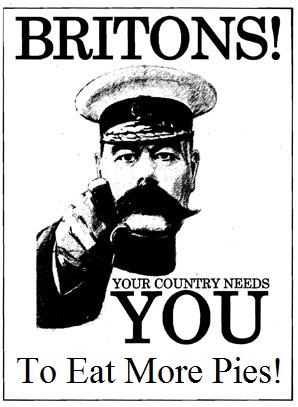 Lord Kitchener, a hero to the British public, trying to instil some sense amongst British men that it was their duty to fight for their country. Would the same kind of thing happen today? Would people feel that sense of duty, that their country's needs are greater than their own? The social awakening which has happened since the 1960s has been a double edged sword. People feel less need to conform to social norms and more free to fulfil their own ambitions. People are more free to travel and socialise with others via technology. Their social group may not be so restricted to their own village, town or country. However, has this come with the cost of a loss of community? It is well documented that in small communities it seems that shops and pubs are closing down at an alarming rate. It seems strange that now people are more free to do what they want, that the environment around us has actually homogenised to a greater extent with the same shops on most high streets. It is clear that this is NOT a good situation for a pie lover. Just have a look at the top 20 pies that we have reviewed. More often than not the best pies come from small independent suppliers. It is true that some good pies can be obtained from the supermarkets or chain pubs but there would be a wealth of variety and quality lost if these were your only options. With this in mind it was good to see a new sandwich shop/bakery open up in the village of Lane End, Buckinghamshire called Kelly's Kitchen. Walking past I saw their sandwich board outside advertising home made pies. The question of what to have for lunch had been answered. Heading inside I found a friendly atmosphere and a range of pies on offer. I opted for a classic Steak and Guinness pie. At £2.50 it wasn't even very expensive for a sizeable pie. This was the perfect takeaway pie. 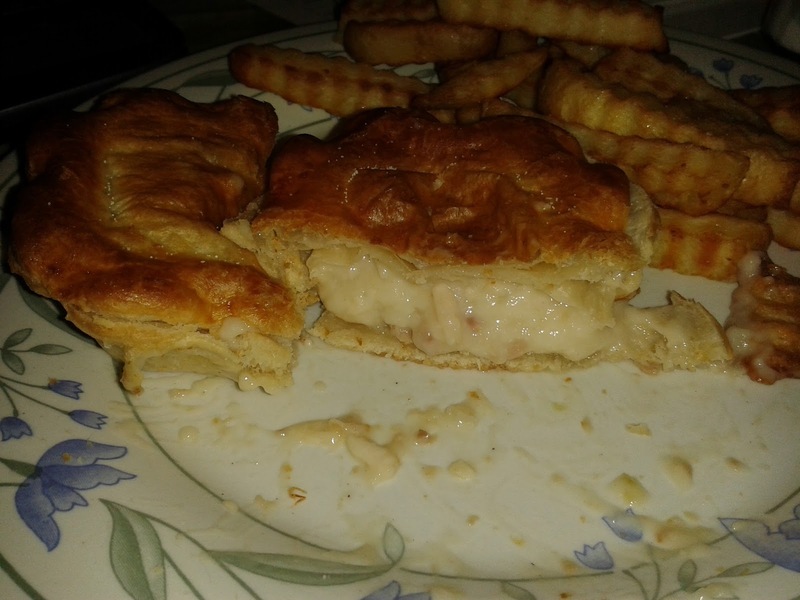 It had solid pastry and held together well. The gravy was lovely and thick so it didn't ooze out too much. The meat was flavoursome. On the downside the pastry tasted slightly too doughy for me, as though it could've done with being cooked a little bit more. I also struggled to detect the taste of Guinness although the pie still tasted very good. This pie actually reminded me of a Pukka pie, with it's deliciously thick gravy. So a solid performer but little more than an average pie. It may not have been an outstanding pie but this is my local pie shop so I am sure I will visit again. It is time for pie lovers to put their money where their mouths are and stand up for their community. Buy the pies in your local shop or bakery now before they disappear forever. 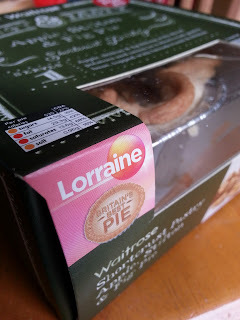 continue reading "Britons, Your Country Needs YOU to Eat More Pies"
We may have all enjoyed the delights of a lunchtime or an evening pie, but how many have enjoyed the sweet savoury taste of a breakfast pie? Well shiver me timbers, look what I found in Morrison’s! This cheeky little chappy was hiding away in the deli section. How long he’s been hiding there is anyone’s guess, but it’s okay, we’ve spotted him now! 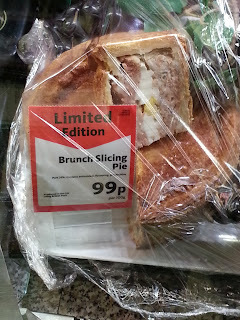 This is a Limited Edition ‘Brunch Slicing Pie’. Although the label sports an ingredients list, one must note the slight omission of ‘egg’ and ‘pastry’ there. Anyway, this lovely thing is 26% pork and only 99p per 100g. I have no idea whether that’s cheap or expensive because I’m terrible with guesstimating weight. In fact, one of the main reasons why I don’t frequent the deli counter that often is because I’m secretly ashamed of being unable to express what weight of olives I require. Fortunately in this case, there’s a perfect Pierateer-sized portion of the brunch pie already sliced. And here it is on a plate. Gosh, it looks a bit lonely there, doesn’t it? At this stage I have to point out that I was eating this pie at about 10pm, so my plate of ‘brinner’ was met with many a confused stare from my housemates. Of course, they were jealous of the pie. And how was the pie? It was great. I had it cold, so it was a bit odd when juxtaposed with the warm baked beans, but I feel that this is a pie that exists to be consumed cold. Like a pork pie. Which is what this pie essentially is, but with egg in the middle. The pork is also more of a sausage meat affair rather than what you’d find in a pork pie (let alone a Melton Mowbray pork pie). And there’s no jelly. So it’s actually not really like a pork pie at all. It tasted good but on the whole was a bit dry and the meat wasn’t great quality. 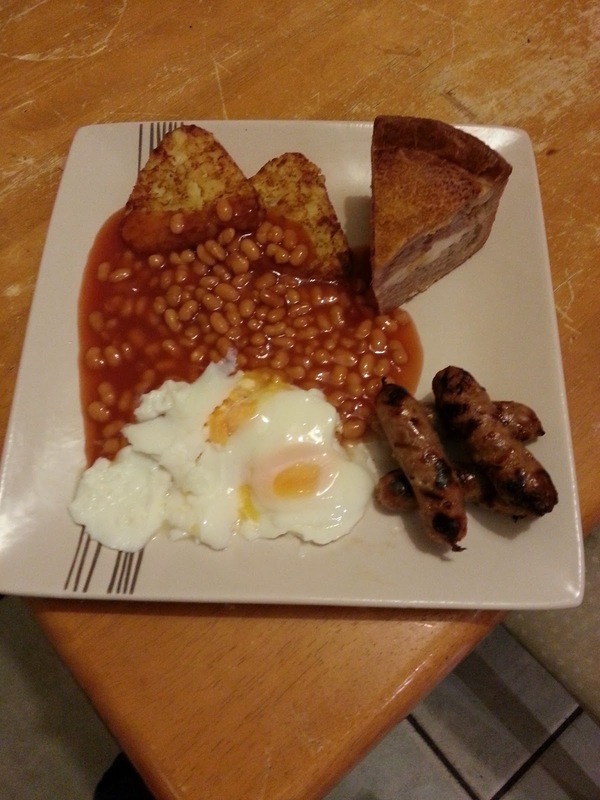 It needed the baked beans to wetten it up a bit. 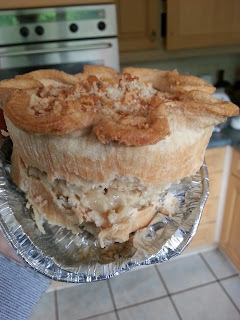 As with all pork pies, the pie was filled to capacity. 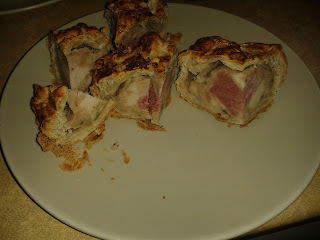 The colour of the pastry was a lovely deep brown but the meat looked a bit strange and mottled. The pie arrived to me in great condition, and felt fresh from the store. 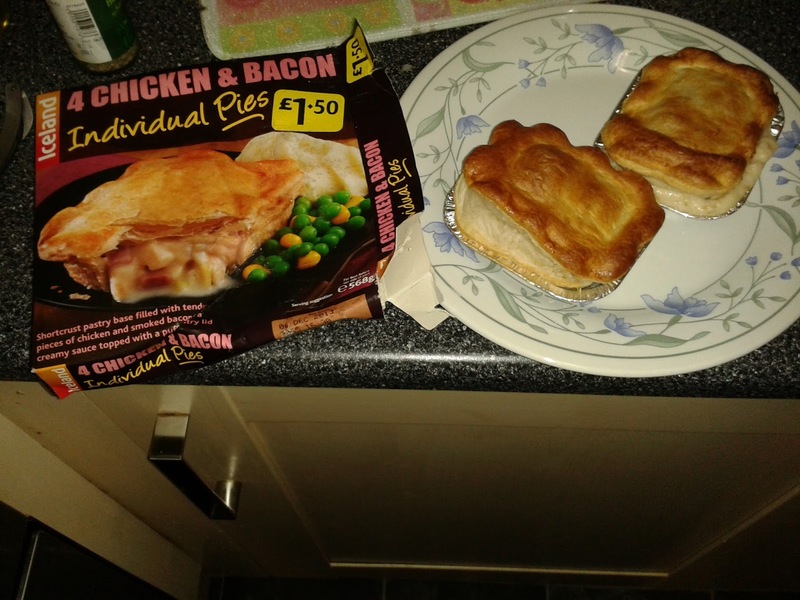 In terms of cheapness, it doesn’t score well, as this pie set me back a fair whack – somewhere about £2.50. This pie felt a bit more like a gimmick rather than something I’d actually look forward to buying again. Good on Morrison’s for making it though! continue reading "Morrison's brunch is pick of the bunch"
continue reading "Iceland – the land of the frozen pie!" 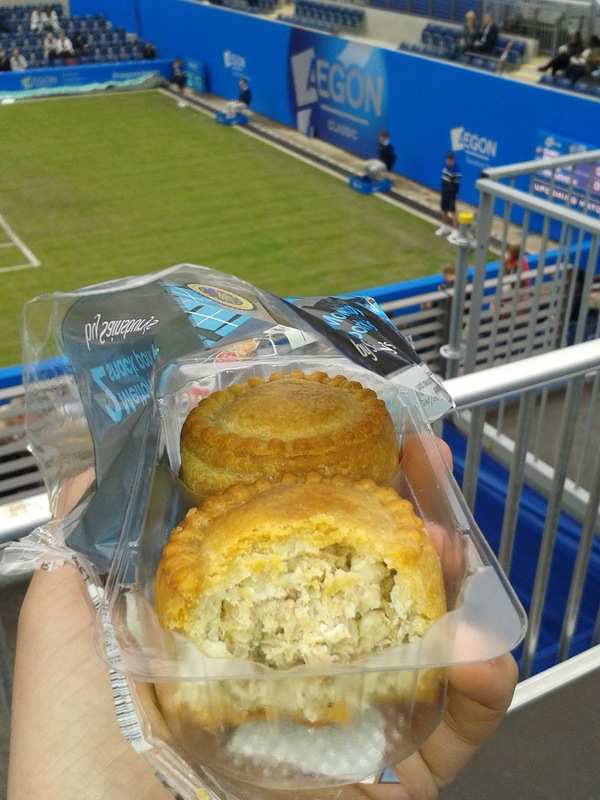 While sadly there were no pie stalls at the Aegon Classic tennis tournament in Birmingham, that didn’t stop this Pierateer taking along a pork pie to eat while he was there! Would the Sainsbury’s pork pie be a classic though? Well the tennis on Tuesday served up some classic matches, with British wins for Heather Watson and Johanna Konta and a number of big upsets including by 16-year old Donna Vekic, though sadly the pie failed to live up to its seeding. However on the grass courts of Birmingham this Pierateer did enjoy a pie, even if it wasn't the pie-light of the afternoon. The pie itself was golden and the pastry reasonably firm. It held the contents well and there was a very strong capacity, with just a few small gaps and a bit of jelly around the pork. The meat was a bit chewy at times, with a bit of fat which did detract from the content, however the meat was generally good. 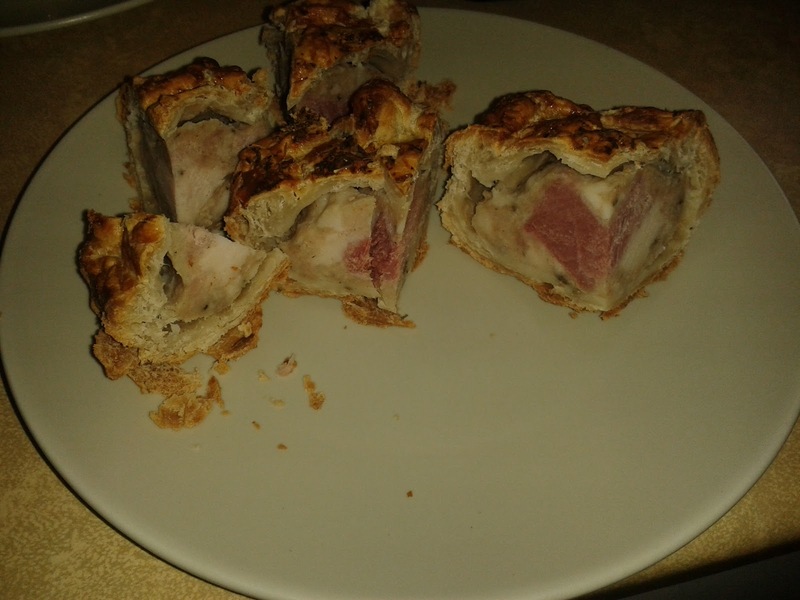 The pork pie was lightly spiced, as you would expect, which did leave a bit of an after taste, however for a reasonably valued Melton Mowbray pork pie it was pretty good. I wouldn't make a racquet to serve up another one immediately, but certainly not a bad option for mass produced Melton Mowbray pork pie. 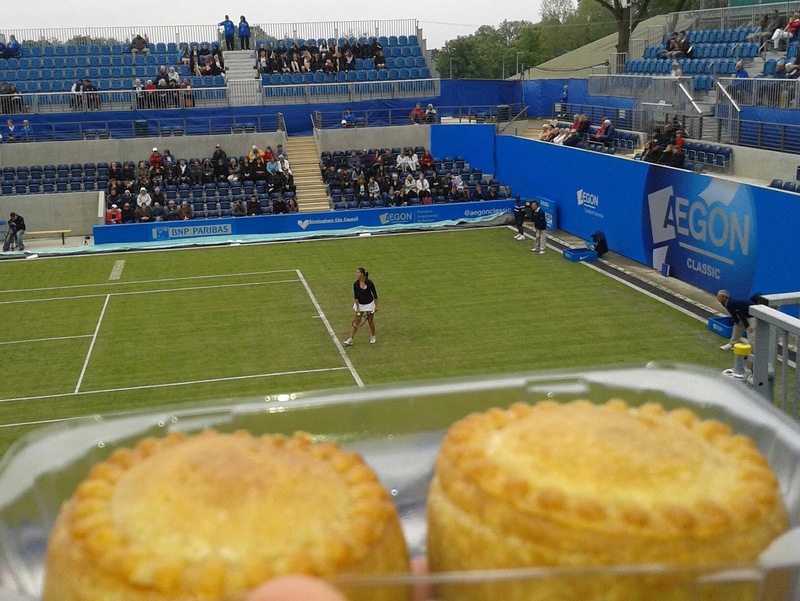 And with the Aegon Classic becoming a Premier WTA event next year, here's hoping they may also invest in a top pie stall to! As an added bonus, Pierateer RAS entered a photo competition at the Aegon Classic Tennis and won a signed T-shirt! The winning photo of Laura Robson and the humble pork pie was as follows – thanks everyone at the Aegon Classic Tennis! continue reading "Serving up a Classic Pork Pie?" 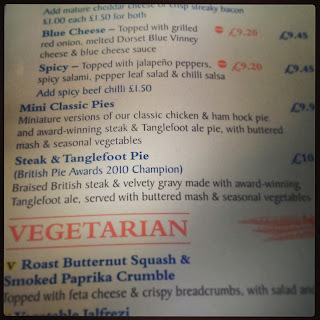 They say you can take the pies out of Melton Mowbray but you can’t take Melton Mowbray out of the pie. Or come to think of it, perhaps they don’t say that and we just completely made that up... Anyways, the important thing to clarify here was that these pies were eaten in the Melton Mowbray pub, which is actually a pub in... well, London. But their “house pie” (the Dickinson & Morris Pork Pie) was brought down from Melton Mowbray, as all top pork pies should be! In any case, with another Fuller’s Ale and Pie House on the horizon, two of the Pierateers – TJP and RAS – honed in on the Melton Mowbray pub in Holborn, central London for another pie. And intriguingly, the pies on offer were all different to any of the other Fuller’s Ale and Pie Houses they had been to (bar the classic “Steak and Fuller’s Ale” pie, which you would expect at every Fuller’s establishment). And with such a variety of new pies on offer, the talk immediately turned to the Pie Tasting Board. With 5 pies – four new pies and a Dickinson & Morris Pork Pie to follow – the Pierateers were in for a busy evening! So in the upper mezzanine overlooking the main pub area, the Pierateers eagerly awaited their pie board for a Fuller’s piefest! And the overall first impressions were good. While the pies were of course quite small, due to being part of a tasting plate rather than each being a meal themselves, the presentation was very impressive and the Pierateers were ready to dig in! The puff pastry on all the four Fuller’s pies looked amazing and they all looked well put together. The puff pastry lid did look a bit like a last minute addition to the pie but was light and bursting out towards you. 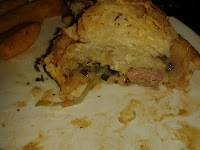 It complemented the thicker pastry base holding in the content, which though quite thick, was tasty and a lot more edible than the solid pastry served at the Old Joint Stock Fuller’s Ale and Pie House. There was also a decent chunk of Dickinson & Morris Pork Pie to. 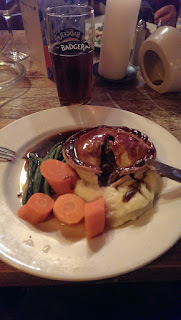 The only issue that arose from the time they dug into the pies was that there had been a bit of a mix up with the pies and we had accidentally been served two Steak and Fuller’s Ale pies, with a Somerset Brie and Sweet Potato pie missing. Of course, no-one wants to be a Somerset Brie and Sweet Potato pie short of a Pie Tasting Board! So with it mentioned to the very helpful staff at the pub, a sixth pie was produced and the Somerset Brie and Sweet Potato pie could join the Fuller’s piefest! The Steak and Fuller’s Ale pie contained very tender pieces of steak, with some delicious nuggets of steak-ness in nice gravy. While the Fuller’s Ale flavouring to the gravy could have been a bit more apparent and a couple of pieces of steak were a bit well-done and therefore dry, the overall flavour of this pie was very good. 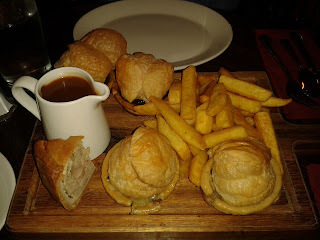 It was certainly better than the Steak and Fuller’s Ale pie eaten in the Mad Hatter pub previously. The capacity was very strong for such a small pie and the meatilicious filling made it the top rated new pie of the evening. While the Ham and Leek pie was slightly less packed with meat than its steak neighbour, the capacity of ham and leek goodness was apparent when cutting into this pie (despite the size). It was an interesting choice, as there had been few pies eaten by the Pierateers where ham played the leading role. While often second fiddle to chicken in a joint pie, the ham was very good quality and the white wine cream sauce complemented the ham and leek well. 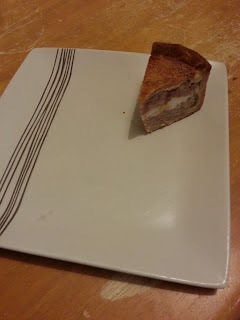 The main detractor from this pie was a rather overly strong hint of mustard seed throughout this pie, which particularly for such a small pie was slightly too much. After finally getting our hands on a Somerset Brie and Sweet Potato pie, we were intrigued as to what it would taste like. Cutting through the pie, there was quite a potent aroma which could be pinned down to the Somerset Brie. Within the pie, there were some large pieces of Sweet Potato which made the capacity of the pie particularly impressive. 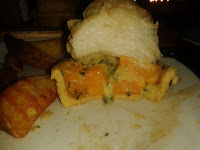 The Brie was primarily within the cheesy sauce which encapsulated the sweet potato, though there was a small piece in the corner of the pie which was quite strong. 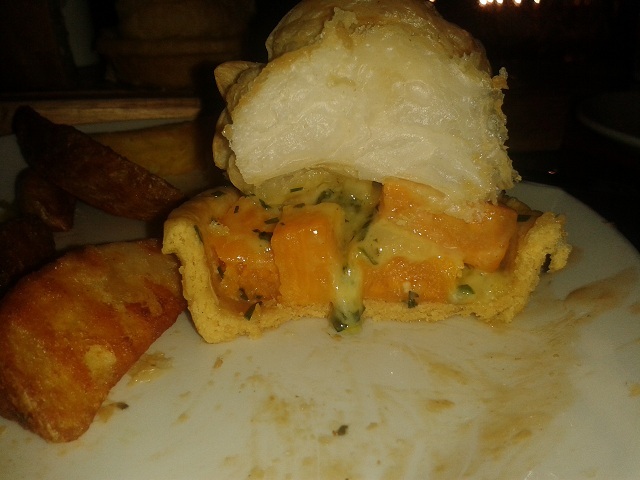 The sweet potato was quite nice, soft and not at all mushy. 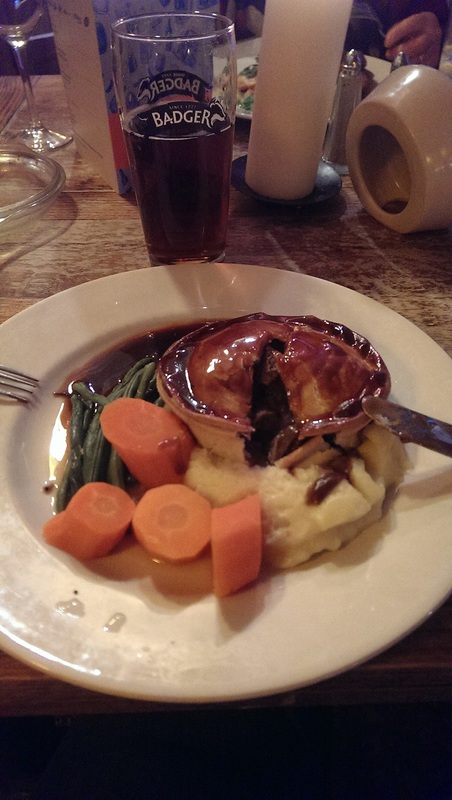 The flavour idea seemed good and it was an interesting change to the standard vegetarian pies on offer in pubs, however the flavour quickly became rather overpowering and while a small pie was acceptable, it was imagined that a full sized pie would be rather sickening. The Dickinson & Morris Melton Mowbray Pork Pie has of course recently been reviewed by the Pierateers and the review can be found here, but was a good addition to the Pie Tasting Board. It was good to see that the Melton Mowbray pub in Holborn, London had gone straight to the top by transporting Dickinson & Morris Pork Pie from Ye Olde Pork Pie Shoppe in Melton Mowbray for the good of the London pie consumer. Overall, it was a good selection of pies at the Melton Mowbray pub, which expand the variety of pies offered by the Fuller’s Ale and Pie House chain but the quality and quantity could be slightly improved on to be one of the top rated pies we’ve eaten. 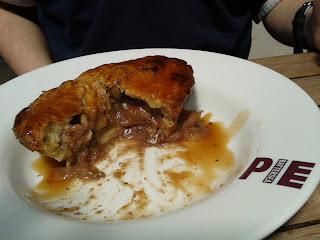 continue reading "Fuller’s can take the pies out of Melton Mowbray..."
Warning: The following article includes reference to something that may shock and appal you: burnt pie. If you are of a nervous pie disposition, please look away now. 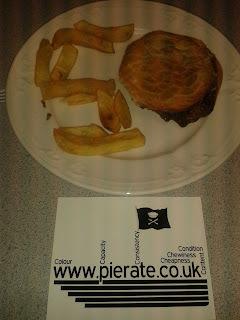 Here at www.pierate.co.uk we may mainly be known for our pie reviews, but we also want to help the public out on anything pie related. That may mean petitioning against the pie tax, debating the height to width ratio of a proper pie or, in the case of below, highlighting inaccuracies in the pie labelling world. The following information has been provided by Barry @QuantumPirate regarding the Tesco pie he cooked and that burnt. 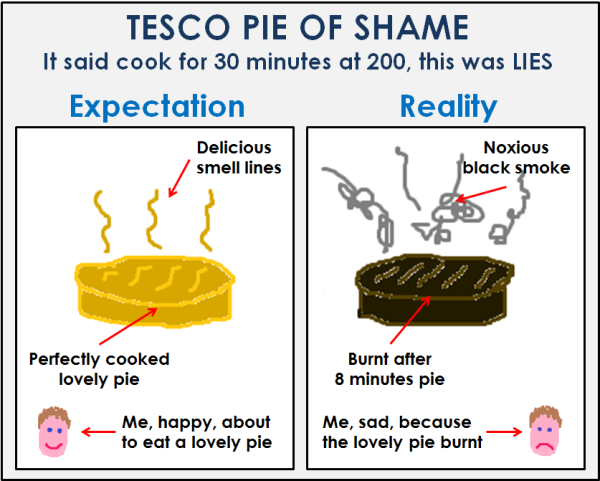 Fortunately Tesco are looking into the matter, as the last thing we want to see is burnt pie! On requesting if I could re-post his image, Barry very kindly agreed by saying “Please do, if it saves one poor soul from burning their pie then I’ll be happy I’ve made the world a better place.” Couldn’t put it better myself! continue reading "Pie Label Warning"
continue reading "Guest Pie Review: "Smuggle me Tanglefoots!"" ﻿When you need some fuel for the afternoon ahead, it's good to station yourself at a top pie shop in town and get pie inside you! That is exactly what I did when ready to combust with hunger on my Bank Holiday, with a non-renewable pie in my sights! 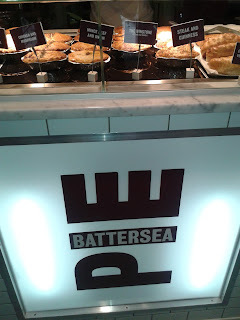 So as I was meeting a friend near Covent Garden, I popped in to the Pie-er Plant that is Battersea Pie Station, ready for some pie fuel! I ordered two pies – one a hot pie to eat then and also a cold pork pie to take away. Firstly I ate the Winstone pie, which was a Steak and Kidney pie eaten hot while on the premises. And I’m pleased to say that the Winstone was a winner. 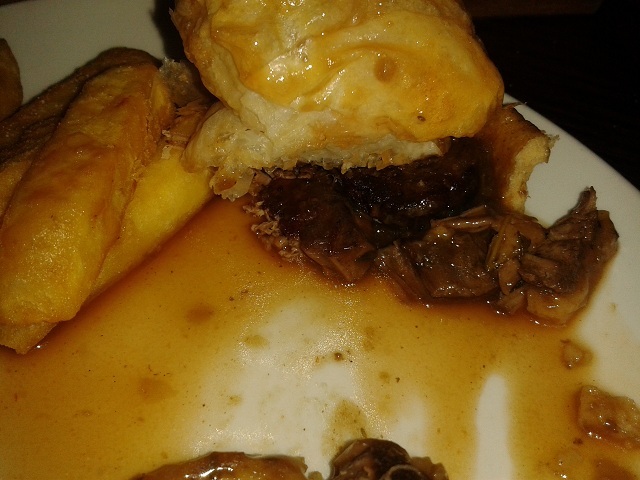 Inside the golden pastry were good tender chunks of steak. 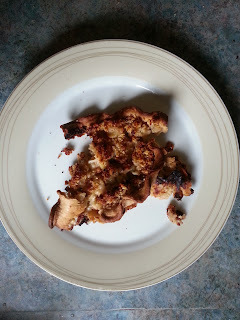 The kidney tasted good to and not overpowering the taste of the pie. The gravy was nice, not too runny and very flavoursome. 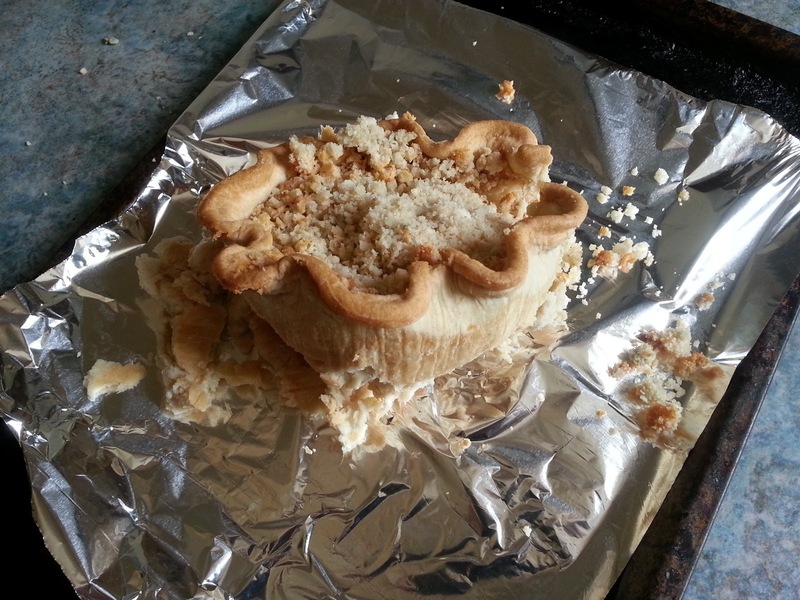 While the pastry was quite crisp, it wasn’t too thick and held the pie together well. The condition was top notch with a golden crust topping. It was nice pastry, reasonably solid but didn’t weigh you down like some thicker pastry can. I also very much liked the Battersea pie bowl it was presented in. It was quite pricey for a pie at £5 to eat in (pie only, trimmings are extra) but was in Central London and Covent Garden after all, so can't get a much cooler place to eat pie! Pie fuel much appreciated! Certainly not something I'd come across before, this pie was pork pie by name but no pork by nature! However the nice ham made up for the porkie in the title! 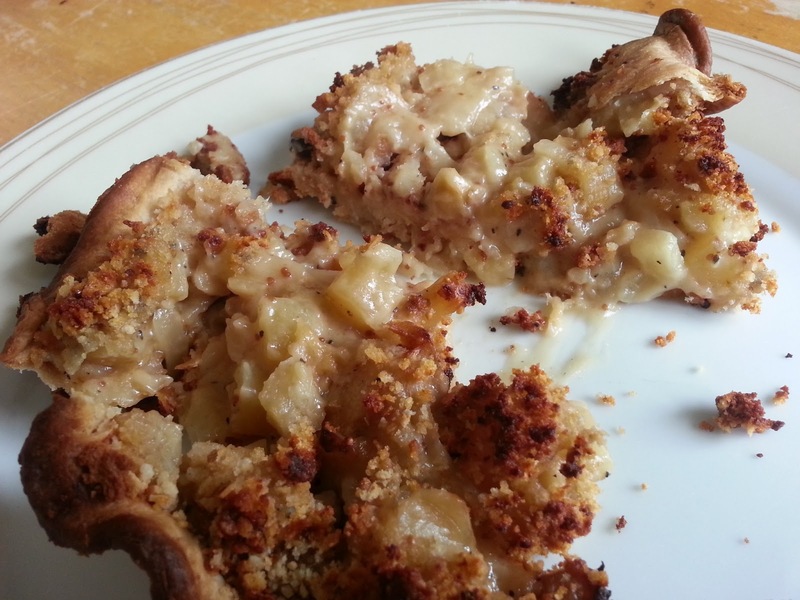 The pie had a very pleasant crust which was quite light and flaky on top and sides, a little thicker on the base. It was a lot lighter and less strongly flavoured than your traditional pork pie. As for the content, the chunk of ham was very flavoursome and quite stringy, not chewy at all and a good addition. The chicken wrapped round the ham and was the major filling. 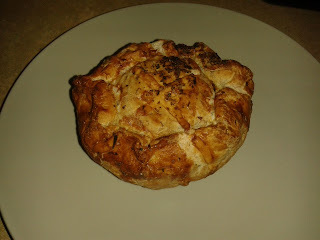 It was a bit tangy, perhaps slightly over seasoned but then you do expect more seasoning with your pork pie style pies! The chicken tasted pretty good, though harder to tell how tender it was in a pork pie style. The colour was good and the capacity quite strong, though there were gaps where you would normally expect jelly (which was fortunately absent, as I think this would have ruined the flavour). It was certainly an interesting for a change but I wouldn't regularly go for it. Marks for novelty though. There was the issue of the meat flavours not being split very evenly throughout, with a large clump of ham off centre, and there was a bit of fat within the chicken section, but certainly a positive meat experiment! 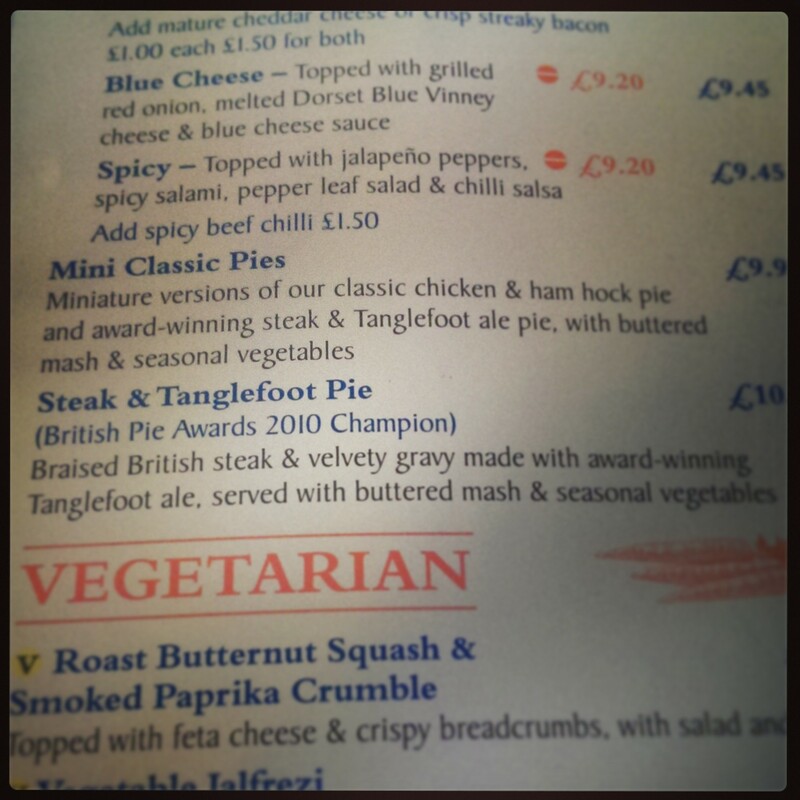 Would love to try a 'meat and gravy' version of this pie though - reckon that would give me fuel for thought! 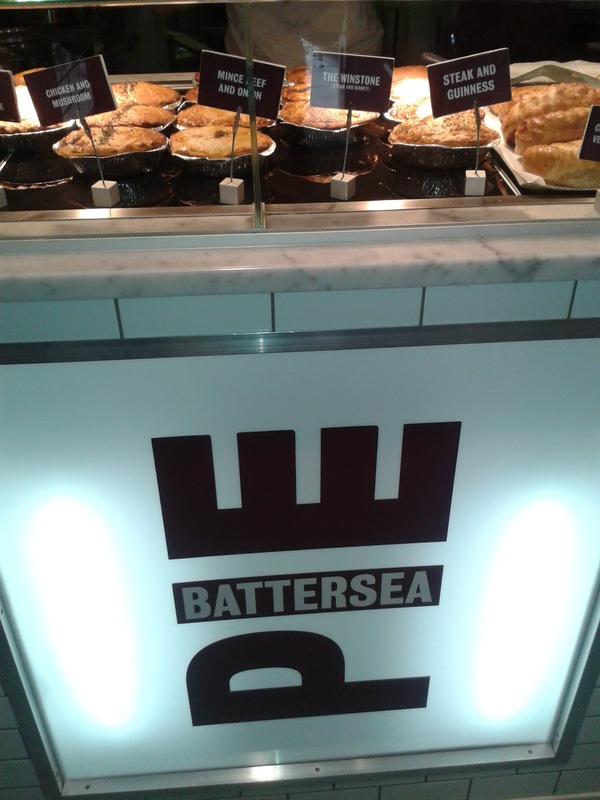 continue reading "Smoking hot pie at the Battersea Pie Station"
continue reading "Britain's Best Pie Review"